Do you believe that you need to create raised garden beds in order to grow a lot of food in your small yard? Not necessarily! When do you really need raised beds, and when should you NOT use them? The concept of raised beds was created so that gardeners with poor soil conditions could have a way to grow great gardens, too. They do not grow vegetables any better than naturally deep, well-drained soil. If you have naturally deep, level, and well-drained soil in your yard, you not only don't need raised garden beds, you probably shouldn't build raised beds! You are better off just laying out your garden beds at ground level, and creating pathways around them. The soil in your pathways will become compressed over time from walking on it, and your soft garden beds will remain slightly raised. They heat up more and dry out a lot faster than level ground, which can be a big disadvantage in very hot or dry climates. They can cost a lot of money to create the frames, and fill the beds with soil, especially if you choose to use Mel's Mix (square foot gardening potting soil). If you choose to improve a poor quality soil, it's more difficult to use green manures/cover crops, as you can’t use mowers or large tillers in raised beds. It's a lot more work to change the layout of a raised bed garden compared to ground-level gardens. Don’t ignore this last disadvantage! Gardeners frequently find that their interests or needs change over time. I've often changed my gardens around after a few years. That's not too hard to do with row gardens or level garden beds, but it's much more difficult to do with raised beds of any kind – with or without framing. I only fully realized the importance and value of having really deep, well-drained soil when I had to create 18” high raised beds so I could continue gardening with my disabilities. I was used to growing crops in 6-8” of topsoil above pretty heavy clay. When we bought clay loam topsoil in 2012 to fill our new 18” high beds, I immediately noticed a significant increase of yields and much more vigorous growth in my larger vegetable crops, such as squashes, tomatoes, sweet potatoes, and large cabbages – even though the imported soil wasn’t any more fertile than the existing soil in my yard. Also, another important benefit of deep soil is that it holds more water. Twelve-inch deep soil will hold twice as much water for your plants as six-inch deep soil will. This allows you to go longer periods between watering your larger garden plants. You can garden with soil that's only 6 inches deep, but your full-grown plants will be much smaller, many of them will be more stressed, you won't be able to harvest as much food per square foot, and you will have to water more frequently – often every single day. Deep soil allows your plants to grow larger and more vigorous root systems which will help your plants to produce more food per square foot. If you have bedrock, water, coarse gravel, or very poorly draining clay within 1-2 feet of the soil surface in your garden site, then your garden plants will probably benefit by having raised beds filled with good quality soil. Your plants will grow better if you create garden beds with good soil that is at least 10-12 inches deep. Up to 24” deep is even better, but to have that, you pretty much have to be blessed with having naturally deep soil in your yard. If there is only 4 inches of topsoil in my yard above extremely heavy clay, I will usually create an 8-inch-deep raised bed on top of the ground. This would give me a total depth of 12 inches of good soil. I also do not use a weed barrier fabric underneath my raised beds, because I want my plant roots to grow as deep as possible. My sweet potatoes, in particular, need deep soil, as their tubers can grow pretty large! 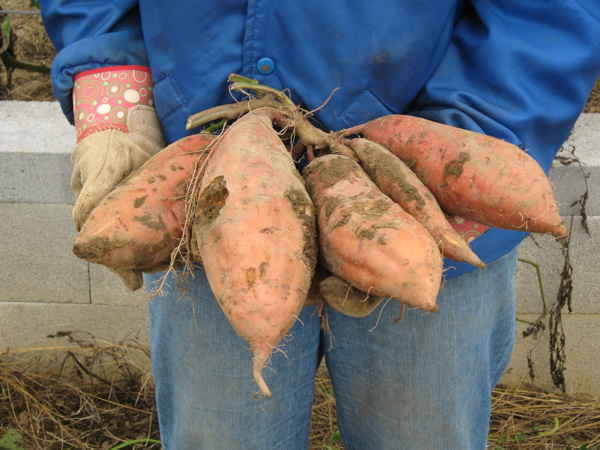 You can't grow large sweet potatoes like these in shallow soil. Not all clay is the same. Some types of clays are much more dense and watertight than others. Some can be so dense and poorly draining that many plants will not thrive or grow well in them – especially vegetable root crops and fruit trees. On the other hand, some clays (though not all) can retain large amounts of beneficial nutrients, and all clays can retain more water between rainfalls than loamy or sandy soils – which can reduce how often you need to irrigate your garden. So, a clay soil can offer you some benefits, if you are willing to put in the effort needed to improve that soil over time. If I had to garden in poorly draining clay soil, I would probably avoid planting many root crops or fruit trees until I had first improved that soil. Otherwise, I would fill raised beds with better quality soil. You test how well your soil will drain by digging a hole about 1 foot deep, filling it with water, and letting it all drain out. Then you fill the hole again with water and time how long it takes to completely drain away the second time (you want to test saturated soil, not dry soil). If it drains within 4 hours, you have well-drained soil. If it takes over 8 hours, it's poorly drained. I had lots of water remaining in the hole in my yard after 12 hours! Our soil is so dense that moles can't tunnel here. The slightly darker 3″ deep layer of soil you see at the top is the only “topsoil” that we have. I had been taught, and believed for many years, that the only way to improve clay soil was to keep adding lots and lots of compost. Unfortunately, organic farmers eventually discovered that they sometimes created major imbalances in the nutrients of their soil by importing large amounts of compost, manure, or other sources of organic matter over many years. These imbalances can reduce the health and nutrient-density of the plants grown in that soil. I have since learned that many of the heaviest, stickiest clays can be made looser and less sticky by improving their calcium/magnesium ratio, and growing deep-rooted cover crops such as grasses and clovers periodically – in addition to adding a moderate amount of compost. If you would like to learn more about properly balancing the minerals in your soil, check out the book The Intelligent Gardener: Growing Nutrient Dense Food , written by Steve Solomon and Erica Reinheimer. I've seen large amounts of soil erode over 10 feet downhill in one single heavy rainstorm, from bare ground in sloped row gardens. You can nearly eliminate erosion by creating level raised beds on hillsides. You sink the frame of the bed into the ground on the uphill side, and have the downhill side of the bed tall enough to create a fairly level garden bed. How do you know if your slope is steep enough to warrant creating level raised beds? One simple way is to just walk around your potential garden site. If you can walk around in all directions without particularly noticing the slope, then the site is pretty level. However, if you notice that it takes some effort to walk uphill or down, or that it feels uncomfortable walking across the slope (you feel like your legs should be two different lengths!) – then your garden will probably benefit by creating level raised beds or terraces. Some of you may have disabilities, like I do, that makes it difficult or impossible to work down at ground level. Unfortunately, a raised bed that is only a few inches high isn't any more accessible to me than a ground-level bed is. So, my sister and I ended up creating 18-inch-high raised beds from concrete blocks. This allows me to sit on the edge of the bed to work in the garden. We created these tall raised garden beds with concrete blocks, to accommodate some of my disabilities. However, there are some disadvantages to this. When you sit on the side of the bed, you can basically only use one hand to garden with, and you will be twisting and leaning your body to work in the garden. To avoid straining my muscles, I switch sides frequently, and only work for short periods at a time. However, if you are able to kneel beside this tall bed, the soil will be close to waist level and easy to reach, and you can use both hands. In some parts of the country, underground pests can do a lot of damage. Most moles are carnivores, but – although they eat worms, grubs, and other creatures instead of plants – they have done a lot of damage in my intensively planted garden beds simply by accident. Their tunnels have often damaged the roots of my very young seedlings planted close together in my beds. Gophers and voles (meadow mice) are notorious for attacking plant roots in gardens. One way to protect your plants is by attaching ½” hardware cloth (metal screening) to the underside of your wooden raised beds. Other people have simply laid the hardware cloth on the ground inside their raised beds before filling the beds with soil. It’s important to provide deep soil above this screen, if you plan to grow deep-rooted plants like carrots, parsnips, or sweet potatoes. If you are creating more permanent raised beds out of concrete blocks, you might choose to install a layer of paver stones or large flat rocks at the bottom of the raised garden bed before you fill it with soil. Space them slightly apart, to allow roots to penetrate deeper into the soil, but close enough to still keep out your pests. I secured 1/2″ hardware cloth to the underside of the wood frames I used to create my previous square foot garden. This kept moles and voles from tunneling into my garden beds. Check out your garden site before you create your garden beds. Many people believe they have to choose between raised beds versus row gardens. They don’t realize that ground-level garden beds are another option that can work extremely well – if they have naturally deep, well-drained soil in their yard, or if they are willing to improve their heavy clay soil over time. Thanks for the great article. It clarified many points for me. I’ve had raised gardens in the past, only because of very clay soil, and space limitations. Suburb back yard scenario. Now I have almost 3 acres of healthy, well drained, deep black soil, and really could not understand why I would want to opt for raised beds. I understand the importance of them for a physical aid…and I may be there sooner than later, but until that need arises, I think i’ll plant in the ground. And YES, as much vertical as possible! Nice site. I love my raised beds. AND, I am faced with the expense of replacing some of the original beds in the main fenced garden, which were banged together out of donated and scrounged material. It is more than I thought, I am seriously considering going back to just raised mounds like I used to have. My soil is sandy and rocky. Drainage is not a problem. I Pests are, though the cats have been keeping the vole population down to a manageable level recently. They also seem to have a natural fluctuation. Ah, dilemmas! I am already thinking about my spring garden. I had been thinking of going back to ground beds. After reading your article and the hot summer and drought here in North Georgia I have decided to enlarge my garden and go back to ground beds. Thanks again for your wonderful site and sharing your knowledge.